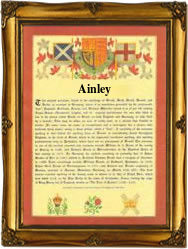 Recorded in many forms including Ainley, Aneley, Ainslie, Ainsley, Annesley, Aynsley, Ensley and Insley, this is a surname which can be either English or Scottish. However spelt it is locational. It originates from any of several places such as Ainley or Ainley Top, a former village in the English county of Yorkshire, and near the town of Elland. It is now bisected by the M62 motorway. Alternative suggestions are from Ainsley in Warwickshire, Annesley in Nottinghamshire, or from either of two now "lost" medieval villages. The first was Ainsley or Ansley in the county of Northumberland, the other probably called Hensley or Hensleigh, in the county of Devonshire. The meanings of the place names are varied, Ainsley in Warwickshire is recorded as "Hanslei" in the Domesday Book of 1086, from the Olde English word "ansetl", meaning a hermitage, with "leah", a wood or glade, whilst Annesley in Nottinghamshire is recorded in the Domesday Book as "Aneslei", and means "the solitary glade". This is from the Olde English word "an", or one, and this is probably a meaning which applies to the other villages. The surname is first recorded in Scotland with early recordings including those of Thomas de Aneslei in Glasgow in 1221; Johan de Anesleye of Roxburghshire in 1296; and in England, John de Annesley of York in the same year, and Richardi Ainley, a christening witness at Elland in Yorkshire, on June 13th 1614. The first recorded spelling of the family name anywhere is in Scotland with that of William de Anslee. He was the canon of Glasgow, in the year 1220, and is recorded in the "Register of the Monastery of Passelet", during the reign of Alexander 11nd of Scotland, 1214 - 1249. Throughout the centuries, surnames in every country have continued to "develop" often leading to astonishing variants of the original spelling.